Combine sugar and water in a small saucepan; bring to a boil stirring to dissolve sugar. Remove syrup from heat; set aside. Zest lemon and orange into 3-inch strips with a peeler removing rind without white pithy part of fruit. Add basil sprigs, jalapeno, lemon and orange strips to syrup stirring until cooled. Refrigerate overnight. Remove basil, jalapeno, lemon and orange strips and discard. Combine basil syrup with brandy and orange juice in a large pitcher. 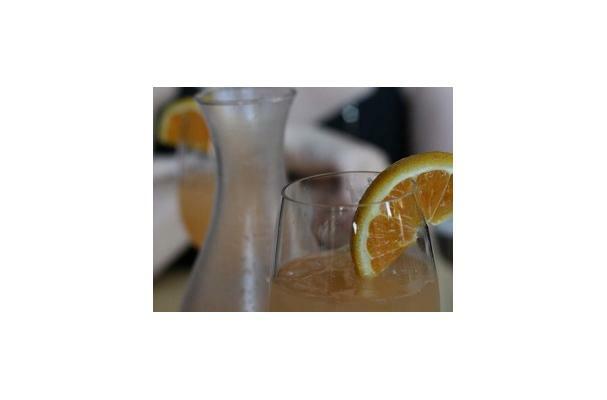 Pour sangria into ice-filled glasses, top with sparkling wine and garnish each drink with an orange slice. Oooh, this sounds fantastic! I love spicy cocktails- the heat ensures you slow down and savor the experience.